As far as I know, this is this first time my book has been endorsed on a game show, so I did a little followup, and it turns out the contestant was Justin Pitts of New York City, and he ended up winning $25,000 on the show. Vagablogging has been in touch with Pitts, and we hope to interview him about his upcoming travel plans soon! Did you ever get a hold of Justin Pitts? 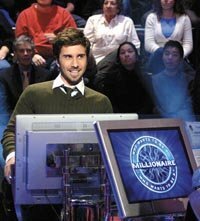 I know this is years later but I only just ran across his millionaire video on YouTube.